It is a long awaited result. I don't know about you. But it is for me. Hosting a contest is really tough and it also gives you a great pleasure and a sense of self satisfaction. Hope I am doing justice to it. 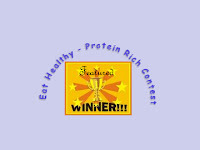 I started the Eat Healthy- Protein Rich contest nearly 2 months back and this was for initially 30 days. But, due to requests from my blog friends, I extended the contest for 15 more days and yes it was a hit. I totally received 170 entries and I chose 15 out of them to compete for the $20 gift card. You can find the round up here. The poll was open for 5 days and we got 360 votes. Out of which 174 votes went to Ramyacooks for her 'Arisim Parupu sadam' made with Toor Dal which is highly rich in protein. Congrats Ramya! Following Ramya was Kalais Experiments in Kitchen 'Cowpea leaves stir fry'. This was my favourite recipe. I have never heard of cowpea leaves before and yes it is rich in protein. She got 93votes. Though I am not giving away any prize for second place this time, my heartiest congrats to her for coming this far. You can find the voting results in My Blog. I will keep the results for a week and then will remove it. My other winner is Srilekha. As I have mentioned earlier I will be featuring her blog for a month starting tomorrow in my blog. This is the first time I am featuring a blog in mine so if there is any particular way in which I can do this, do let me know. Your ideas are welcome. Again, I would like to express my heart felt Thanks to all the Participants and the supporters. I really appreciate your efforts and would like to have them in future too. The next event/contest will be up on 15th of Aug'08. So do not miss it. Do participate and make a huge hit. I would like to give more prizes but since I do not have any sponsors yet, I will be able to give only 1 gift card, which is sponsored by my husband. But I am planning different give aways.Hope I can make more people win the next time. wow! really its a tough job to host contest and selecting a winner! u have done a great job1 awaiting for ur upcoming event! Congratulations to the winners. They really deserve them for their wonderful entries. YOu have done a great job by hosting a fantastic event dear Sangeeth! BTW, you have given a wrong link to Ramya's blog. Check it out. congrats to all the winners. and waiting for the next event sangeeth. Three things are waiting for you at my blog. Come and collect them. a treat for u in my blog! You have done a great job! Congrats to the winner!! !